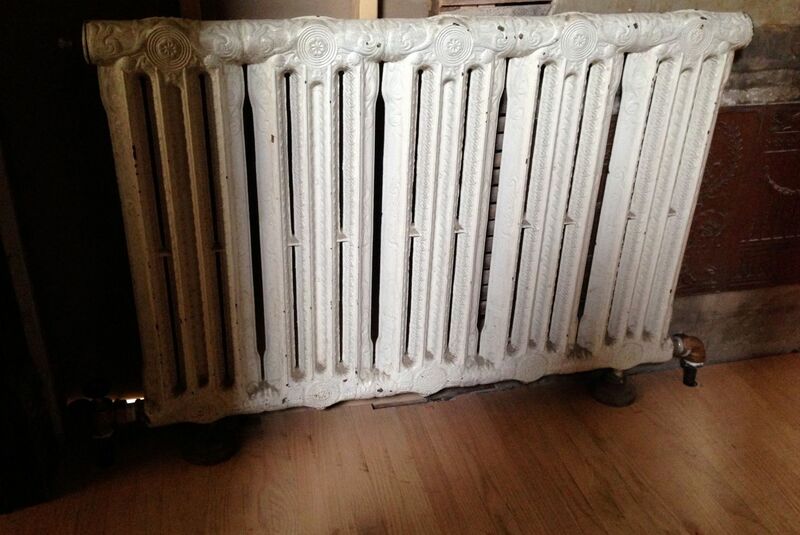 Today, we think of radiators as charmingly old-fashioned. 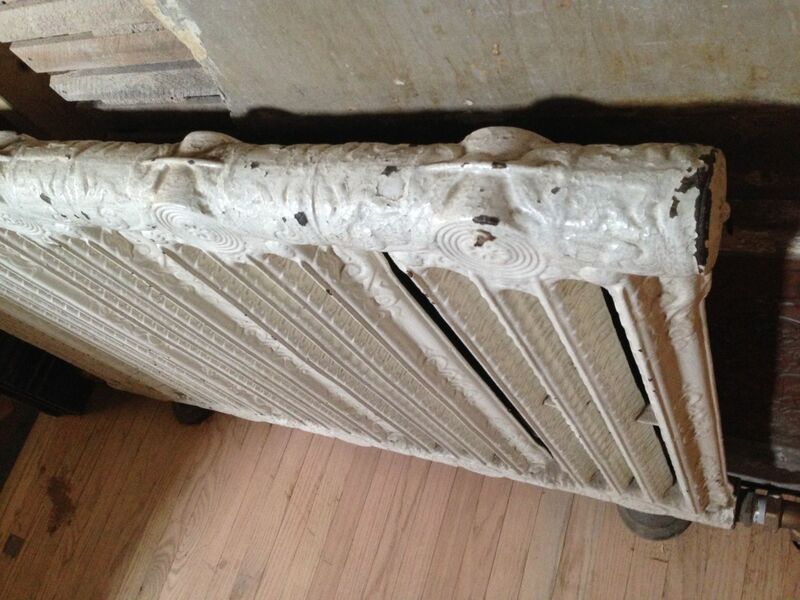 However, when the Cross House was built in 1894, radiators were state-of-the-art technology. There can be no doubt that people, when first stepping into the Cross House in 1894, exclaimed — breathlessly — “Can I see the radiators?” They would have oohed and aahed while standing before these miracles of modernity, and gently, reverently caressed the hot-to-the-touch metal. Since the dawn of time, people had warmed their interiors by fire. But radiators were something altogether new. They could heat a whole house as if by miracle, and with the added (and huge) benefit of not covering every surface and sofa and curtain in soot, and without any seeming maintenance effort (like cleaning out fireplaces every morning, and then laboriously putting wood/coal in every fireplace). Today, we have advanced to forced-air systems. But is this an advance? Forced-air heat dries EVERYTHING out. Wood shrinks and cracks (such as furniture and trim and doors and cabinets), and my ever-aging eyes also dry out. By the end of a winter season, my poor eyes HURT! It took me years to make the connection between forced-air heat and my poor ol’ dry eyes. And, economically, it is more expensive to heat a house with forced-air than with radiators. There are other issues, too. I have never enjoyed sitting in front of a forced-air supply duct. But, I love sitting next to a radiator. So do my cats. Even though the Cross House has radiators, it also has a 3-zone HVAC system, providing both heat and cool air. The previous owner, Bob Rodak, installed the cooling system, which I converted to also provide heat (this change was not expensive, and it seemed a good idea to have a back-up heat source). Curiously, there were no return ducts to speak of, so I installed these, too. Their value is detailed below. It certainly can be argued that, because I jumped into the monumental restoration of the Cross House, I am not entirely sane. As added evidence of insanity, I have spent vast sums this year to have the radiator system fully activated in the Cross House…even though the house already has a forced-air heating system in place. Before I can finish the interior of the house, I must first do all the things which will later be hidden inside the walls and floors and ceilings, like electrical, plumbing, and radiator pipes. So, the latter must be done now, as it is otherwise impossible to progress on all the other necessary tasks such as repairing plaster, refinishing floors, installing cabinets, painting, etc. Luckily, financially speaking, I had a good February and a very good early March, and thus called in Modern Air to get the radiator system fully functioning. 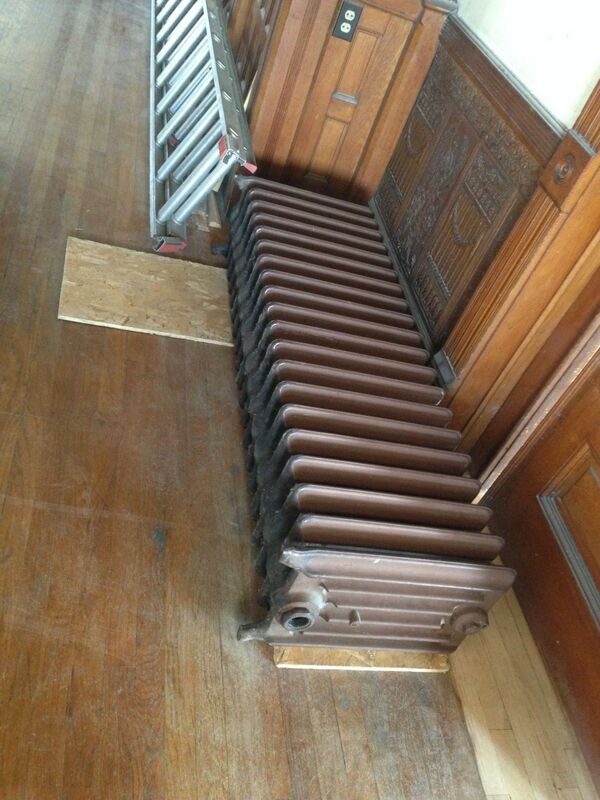 Almost all the 1894 radiators were still in the house. But some were cracked. Some were in odd places, like one in my future bedroom. The monster sat right in the middle of a long wall, precluding any possibility of a bed or dresser being against the wall. How dumb is that? I had the monster moved to another wall, in the corner, where there is not the likelihood of it ever interfering with furniture placement. In the kitchen, another monster sat right under the massive south-facing window. The perfect place for a heating monster, right? But it was also the perfect place for the sink cabinet. I had the radiator moved off to the side. There were also rooms which did not have, nor ever have, a radiator. Like in the main upstairs bath, the pantry (with three exterior walls), the servant’s hall (with four exterior walls), and other spaces. As I am a comfort fiend, I wanted radiators in these spaces. There were also burst radiator pipes, pipes which had been mysterious cut off in some distant past (why? ), and some fittings which were corroded and could, could, burst at any moment. Or a century from now. I braced myself, and told Modern Air: Fix everything. 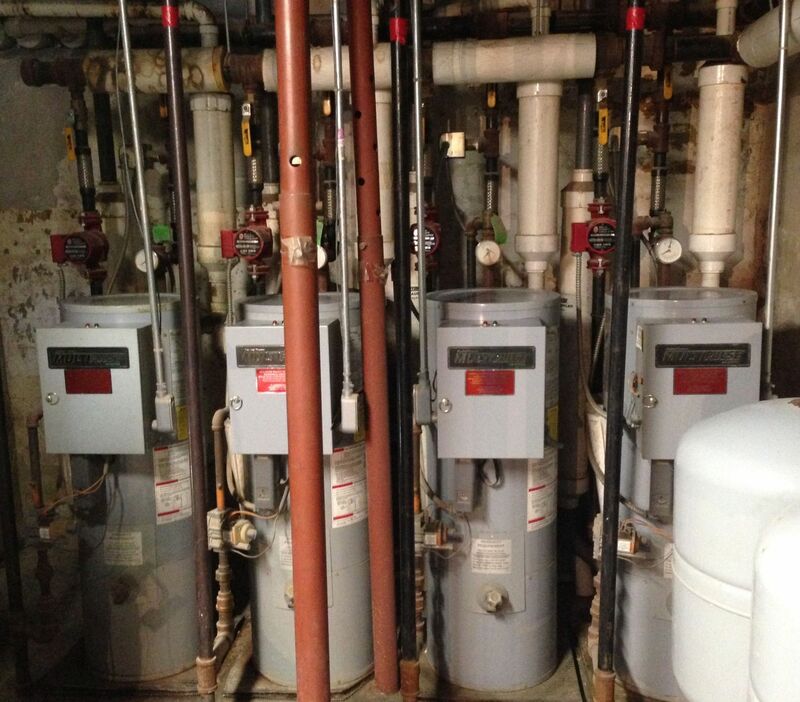 The previous owner (God love ’em) installed four high-efficency pulse boilers. These are, well, fabulous. If it is only sorta cold, one will turn on. A bit colder? Two will run. Colder still? Three or perhaps all four will run. They also rotate. So, if boiler #1 runs on Monday, boiler #2 will run the day after, and so on. This way all four receive the same amount of use. Cost-wise, the boilers are a fright. One was not working when I purchased the house. Modern Air gave me a quote of $1500 for parts. “No way!” I exclaimed, “Let’s just order a new boiler!” They calmly replied that a new boiler would be $7500. Oh. Suddenly, $1500 seemed reasonable. Today, I never quite really see the four boilers. Instead, I see about $40,000 (including installation). Which explains why I, on a regular basis, reverently caress the boilers, and keep them clean. …and this is in the Round Bedorom. I am quite fond, perhaps unnaturally so, with this TALL and SKINNY radiator in the south hall. In the basement are radiators inexplicably up in the air. Most curious, although fascinating. It took me forever to discover WHY they hover in the air like cast-iron UFOs. Not even Modern Air knew why. Nobody knew. The answer came, of course, from a guy who had restored his big old house, and after an ancient plumber revealed the long-lost secret. A century ago all radiators were heated by gravity-fed boilers. This meant that the heated water rose by gravity (heat always rises). Thus, no radiator could be BELOW a boiler. Oooooooooh! That makes sense! Today, all boilers PUMP heated water through a radiator system, so my cast-iron UFOs could, could, be brought down to a more sensible location resting on the basement floor. But, although more efficient, they would be far less…fascinating. They will stay hovering. …I had all the valves replaced. MUCH nicer. And my sensibilities are no longer pixilated. I was only missing one radiator. It was a long, low one which originally sat in the library, in the south-facing bay. It had been removed, I surmised, so a bed could be placed in the bay when the room was converted into a bedroom. A standard radiator was then installed on another wall. But, I needed every inch of wall for book shelves, so the search began for a long, low radiator. Because the Cross House is blessed, my search led me just across the street, where my neighbor was removing the radiator in his living room. It was long and low. Did I want it? YES! Here, four burly guys from Modren Air struggle with the beast. It was painful watching them. It was like watching guys try to lift a car. But I think a car weighs less. 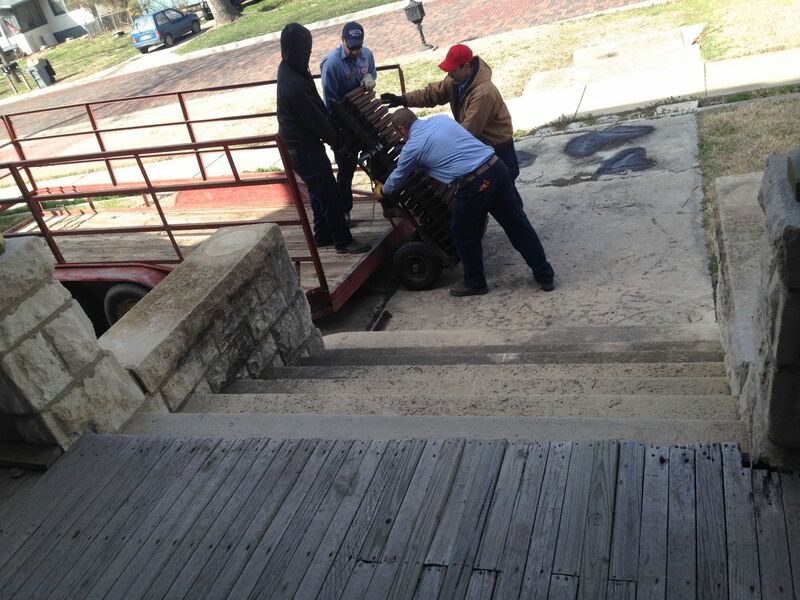 The beast being manhandled into the Cross House. Oh, I do love stone steps. It is also good the steps were stone, as the beast would have crushed wood steps. The beast temporarily resting (napping?) in the grand foyer. About 80% of the 1894 radiator pipes are intact. This is kinda a miracle. 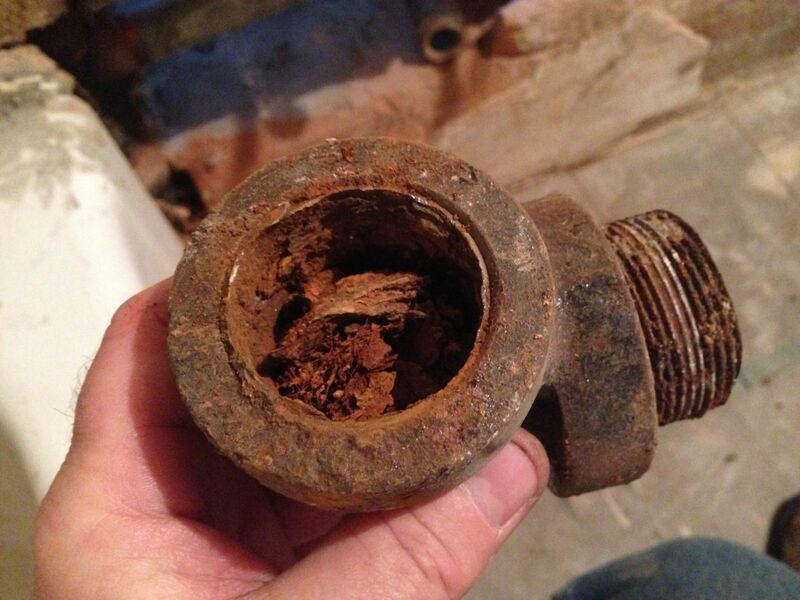 Suspicious pipes/fittings were removed, often revealing scary things like this. No horror movie has ever terrified me as much. 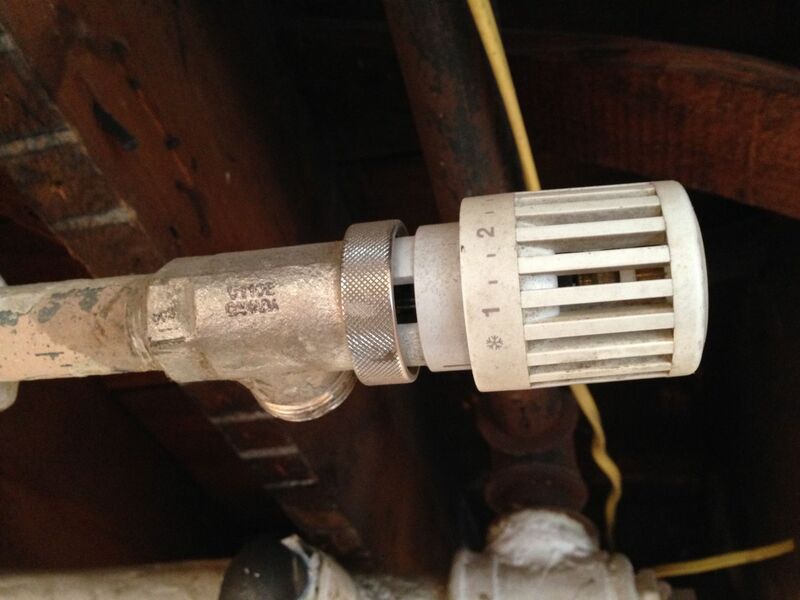 Modern Air recommended that all the new pipes have shut-off valves in the basement. Who am I to argue with burly men? 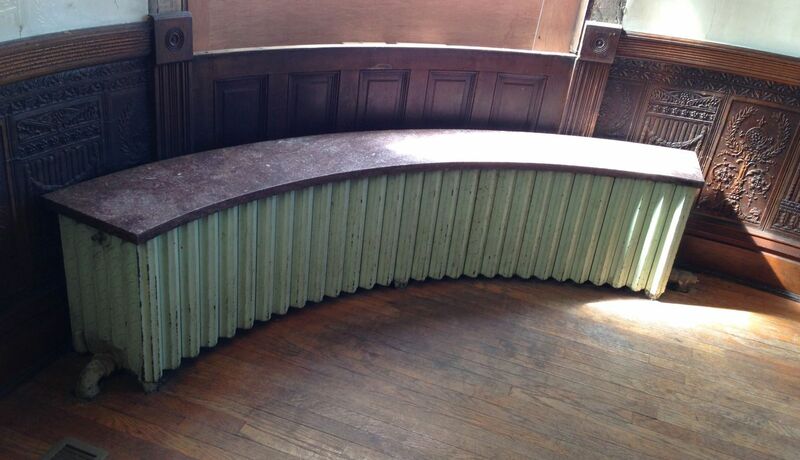 Originally, every vertical radiator pipe in the house was hidden INSIDE walls. None were visible, as is common. This gave the house a real elegance. However, two set of pipes in the dining room, both in exterior walls, had frozen some long-ago decade and burst; never to be repaired. I knew that if I simply replaced the pipes, they would, at some point, surely burst again. I cannot be so cruel to a later owner, so, after much thought, I moved these pipes INSIDE the room. May God forgive me. The heros. Danny (left) and Travis (right). Travis is a co-owner of Modern Air. It is always a pleasure working with people who really know what they are doing. I was, and am, kinda awestruck by the craft of these guys. And their tools are way cool. The beauty of having a forced-air system in place is that when the radiators are on, I will turn the forced-air system on FAN, and all that expensively created hot air will be sucked into the massive return ducts I installed, and redistributed throughout the house. 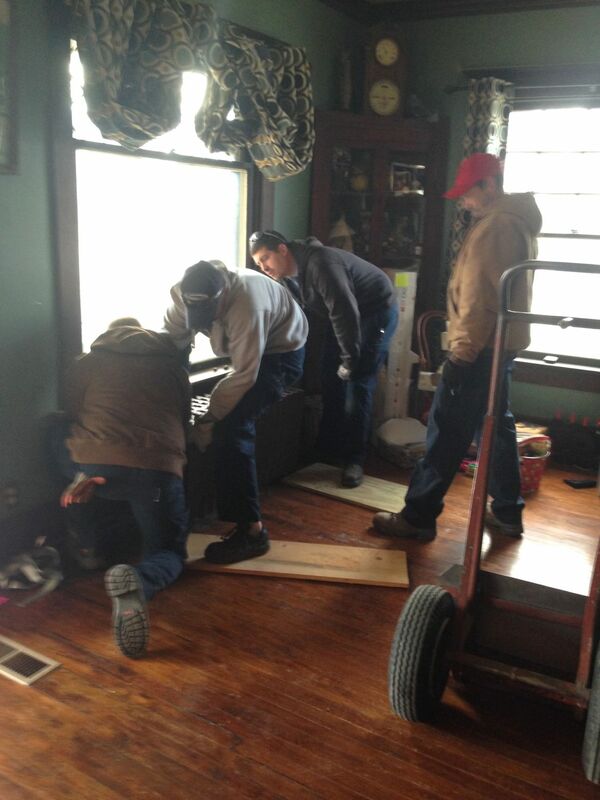 This will not only make the house way more comfortable, but will also significantly reduce heating costs. It is amazing to me that the house never had a return duct system. This meant that the radiators created warmth, and because hot air rises, all that expensively-created warmth went UP. So, the basement would always have been chilly, the first floor kinda chilly, the second floor warm, and the top level hot. As 85% of heat also rises straight up and OUT of a house, this meant that the Cross House would have been helping to warm Emporia these past 120-years. Not only will the new return ducts make a huge comfort/economic impact, but I have other plans to assure that my expensively created warm air will stay in the Cross House. When I am done, I believe that my big old house will be reasonably economical to heat and cool. 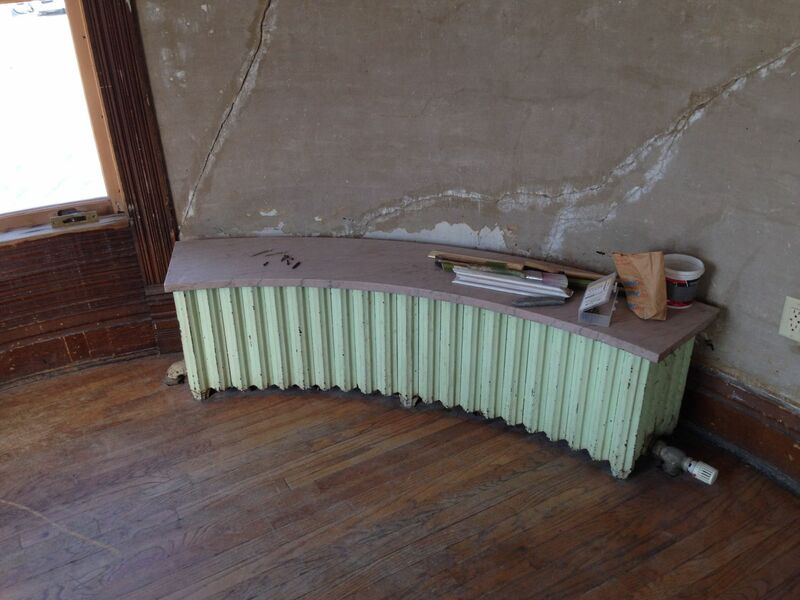 Today, the Great Radiator Project is 90% completed. The beast still sits in the grand foyer. And a few other odds and ends are not done. I hope the Cross House radiators appreciate my obsessive love for them. Two hundred years from now, when the Cross House is still standing, someone will bless you for all the work you did to keep them comfortable on a cold Kansas winter night. And they will bless the previous owner for installing the pulse boilers. There is nothing more magical than steam heat. Radiant heat is nice, until someone parks furniture in front of the radiator and the other side of the room gets chilly. Some sort of air movement methods work well to eliminate the chilly spots. My grandma had radiators in her house, the one in the bathroom was perfect for warming your bath towel! I think I’d love to park my socks and skivvies on top of one before going to bed, so in the morning I have some cozy warm clothes to put on. This post just makes me deliriously happy. Amy! I am delighted to cause delirium! I’m doing a lot of study right now on Victorian life, and the amount of things done in a kitchen, from bathing to medication and minor surgery is fascinating. I fell in love with radiators in my eighth grade science class when my desk was pressed up against one (guiltily, I admit to sometimes chipping the green paint off). Science was my least favorite subject, so I credit sitting cozily next to this radiator for getting me through. There is no heat more efficient, as far as I am concerned and I love that you can safely sit things on top of them and/or cover them up if you want. Although I think some of them are quite beautiful works of art and would never hide them (love your skinney one!). I even enjoy hearing the pipes banging and hissing, as they’re prone to do sometimes. So you have my admiration for preserving “the beasts” and I wish you luck in your monthly contributions to Modern Air! Steam heat is my favorite! And those pipes on the outside of the walls heat up really well also. I love radiators! My favorite type of heat. I’ve been shopping for an old house to fix up myself, and radiators are a must have. Oh! Let me know when you find your dream home. With radiators! Hell knows no wrath like my scorn for forced hot air. 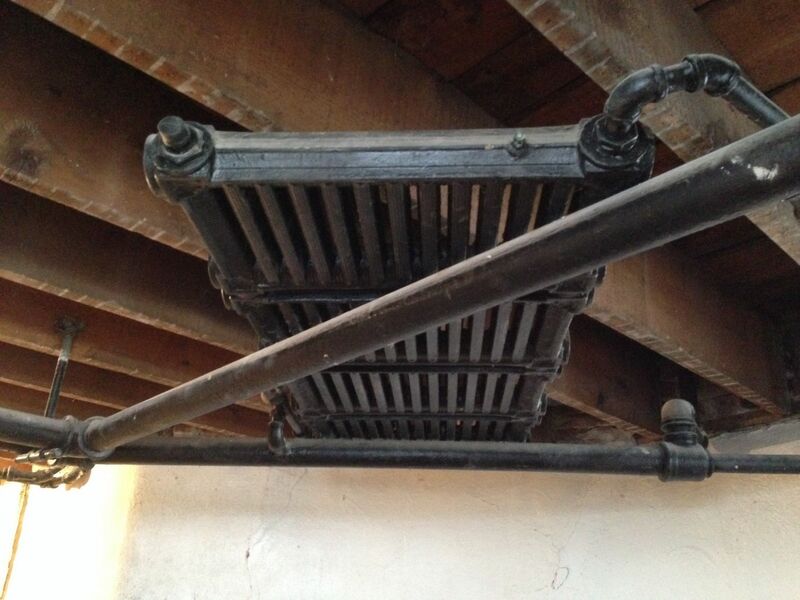 When looking for an old house to buy, a forced air system was a DEAL BREAKER. Ditto those stupid baseboard electric radiator demons. Radiators all the way! You are, obviously, a kindred spirit! With such “evidence of insanity” we certainly wouldn’t want your “sensibilities pixilated” because “The Cross House is blessed” BY YOU! EVERY PART of CH appreciates your “obsessive love,” and so does the rest of Emporia. I think those black pipes look elegant. Why on earth would your installer suggest there be ball valves on the new piping to the radiators? The only purpose they will ever serve is to hold back condensate and create start-up noise. You were restoring the system. 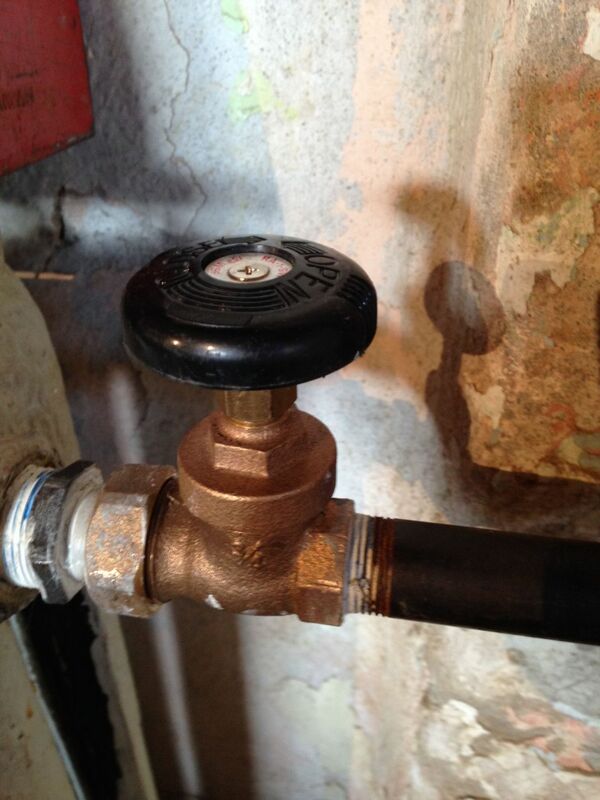 Why on earth did you let them use black malleable fittings instead of cast iron steam fittings? Since when do steam pipes “burst” ? 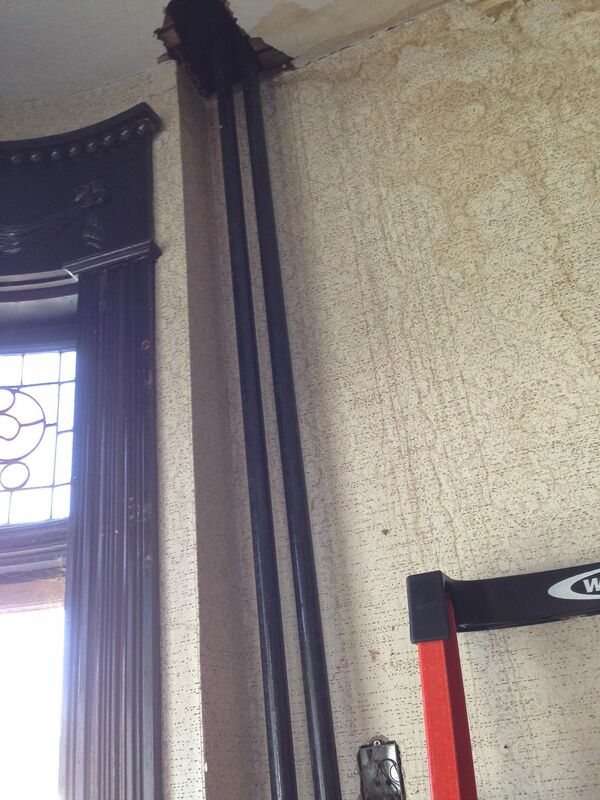 The vertical pipes don’t hold water, just a trickle of condensate as it passes through to the boiler/wet return. I came across this blog while searching for some other information about 2-pipe steam but became a bit horrified as I read through it. I hope your system is working fine. I am curious why you seem so mad. I did not hire air conditioning contractors. I hired heating/cooling people. And Travis used to own a radiator/boiler repair company. So, you don’t agree with my answer for the why of ceiling-hung radiators? OK. But what is your answer? Don’t be shy! I installed valves to the new pipes so parts of the system could be shut off if there was ever a problem, rather than shutting the whole system down. 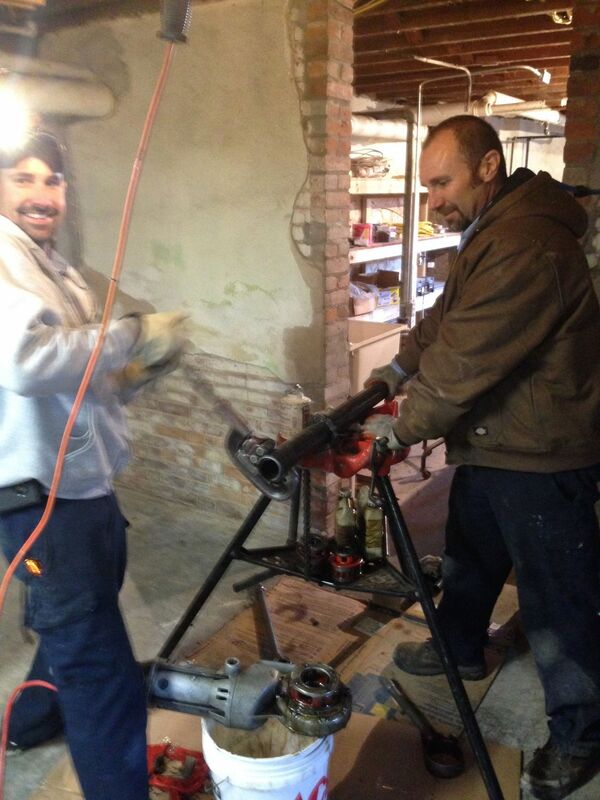 All the new pipes are cast-iron. Since when do vertical pipes burst? Come on over to the house and I can show you burst vertical pipes. Also, I do not have a steam system. I have a hot water system. Those valves on the steam supply lines look woefully out of place and useless. 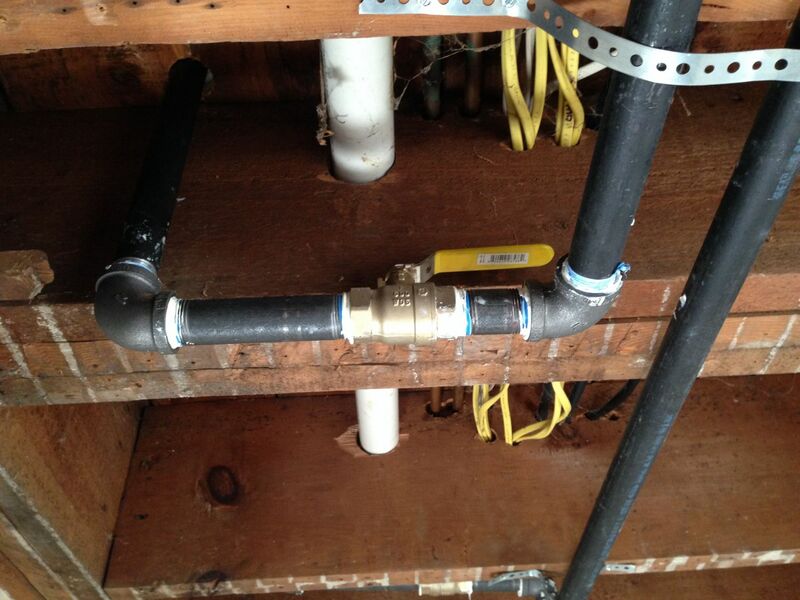 No original residential steam installation incorporates shutoff valves on a supply line below the floor. It creates a place for sediment and standing water to accumulate. Smooth continuous pipe is what belongs on a steam branch to a heat emitter. And if you can show me a steam line that froze and burst, then I’ll show you a failure in the system: like a clogged return line, or a failed trap or check valve. There is no reason whatsoever for a pipe above the boiler’s water line to be full of water. Ever. I apologize for my tone. I share your appreciation for steam and radiator heat and I hate to see it mishandled.